Here we review the theory and methods of the two basic stochastic models with absorbing states: percolation operators and contact processes. We explore connections between them by studying discrete-time approximations of a continuous-time contact processes. In particular, we look at the approximations based on both synchronous and asynchronous updating schemes. Additionally, we go on to discuss several individual-based models, which are commonly used to model different biological phenomena. Specifically, we focused on models with absorbing states that, have spatially non-homogenous stationary states, or that have shown to be bi-stable. More generally, we aim to demonstrate the challenges associated with reconciling different mathematical descriptions of natural phenomena. I am grateful to Prof Robert MacKay for introduction to the fascinating world of probabilistic cellular automata and for showing me different techniques for analysing them. I am also grateful to the editors and the reviewers for their many insightful comments, which greatly improved this chapter. 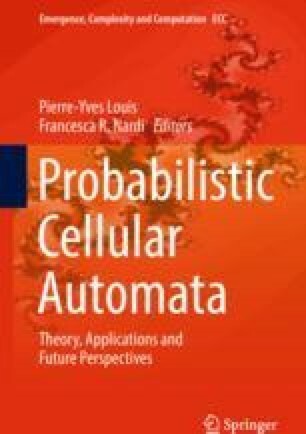 Finally, I would like to thank the organisers of the workshop on “Probabilistic Cellular Automata: Theory, Applications and Future Perspectives”, June 2013, Eindhoven, for the opportunity to meet and learn from the experts of the field of PCAs. The research of the author has been funded by The Alfred P. Sloan Foundation, New York.